As a hobby welder, I keep one bottle of C25 gas and another of 100% Argon for aluminum MIG work. It’s impossible to judge how long the gas will last. So when the MIG bottle gets low, I’m cautious about starting a new project. Do I buy another bottle of C25 or trade in a not-completely-empty one for a fresh bottle? Never happy with these options, I’ve also questioned: In a pinch, could I MIG weld with 100% Argon? Can I use 100% Argon to MIG weld steel? Yes, 100% Argon can be used to MIG weld steel, but you’re likely to get an unattractive weld bead that is tall and narrow, often with a weld-weakening undercut. Mild steel MIG welds using 100% Argon shielding gas are also known for losing ductility. So on top of being weak, the welds can be brittle. 100% Argon doesn’t provide enough thermal conductivity for a fluid weld pool when MIG welding on ferrous metals. The outer edges of the arc remain cool, resulting in a deep but narrow penetration profile, and minimal fusion. And with more spatter and an erratic arc, to go along with a stiff weld puddle, this is not a welding setup you would enjoy using on a regular basis. 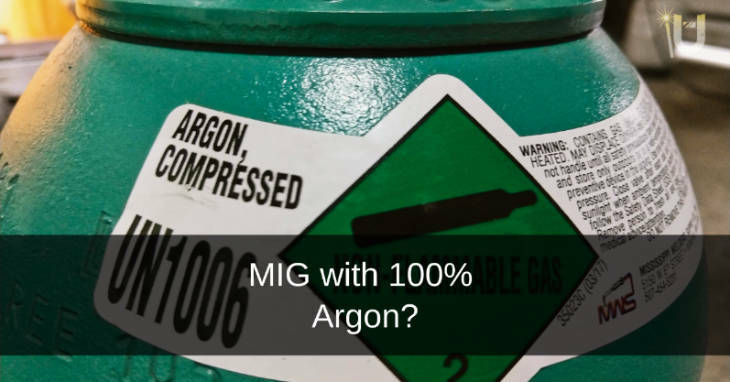 For full-time use, 100% Argon is not a suitable replacement for MIG-mixed shielding gas. I don’t hesitate to use 100% Argon on MIG welds—as long as it’s a project that’s not going to hurt someone or cause me a lot of trouble if a weld fails. It’s natural to want to turn up the heat when you see the high, narrow, cold-looking welds. 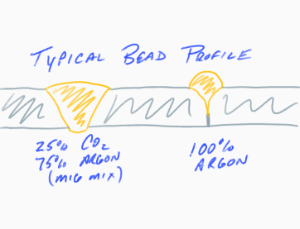 But with the narrow penetration profile of Argon, you’re likely to burn through thin materials before the bead flattens out. Beveling your joints can help achieve better fusion for stronger welds. 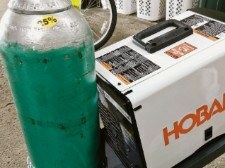 What can you MIG weld using 100% Argon gas? Helium, with its higher thermal conductivity (and cost), is often blended with Argon for use with thicker non-ferrous materials. Why blend CO2 with Argon in MIG mixes? At low temperatures, CO2 is an inert gas. At welding temperatures, CO2 becomes reactive and cleaning action improves. When added to Argon welding gas in small amounts, usually 5 to 25%, CO2 helps to stabilize the welding arc. With an Argon/CO2 MIG mix, you’ll get a more fluid weld pool with improved penetration, along with reduced weld spatter. At higher levels of CO2, the arc becomes rough, and the amount of spatter starts to increase. The strong penetration characteristic becomes harder to control when welding on thin metal. You’ll find Argon/CO2 blends labeled according to the percentage of CO2 gas in the mix. So a C25 mixture is 25% CO2 and 75% Argon. Shielding gases have different jobs in different processes. In MIG welding, where the consumable filler material forms the electrode, the metal transfers across the arc to the weld. While with TIG welding, the filler metal feeds into an arc established between the material and the tungsten electrode. TIG welding benefits from a shielding gas that remains 100% inert at welding temperatures, and pure Argon fits the bill. When used in TIG welding, Argon promotes easy starting, stable arcs, and keeps the non-consumable tungsten electrode clean. Is there any doubt how Bob feels about Argon welds? Of course, he’s a professional responsible for teaching and maintaining the highest of welding standards. But he also has the experience and resources to make that happen. Me? Sure, sometimes I want pretty welds (I’d like more of my welds to look like the ones Bob described as “Blah!”). But more often, I need to be effective and complete the job using the resources I have on hand. Under the right conditions, a hobbyist welder can use straight Argon to make effective MIG welds. Whatever project materials we use, we are always ultimately responsible for choosing fastening methods suitable for the intended use of the finished project. This is true whether using screws, staples, adhesives or welding. The next time you’re caught short on MIG gas, go ahead and feel free to experiment. Try MIG welding with 100% Argon. You may be able to finish your project without a trip to the supplier. Just know that results will vary. Use sound judgment and test your work so that no one gets hurt. We’d all like to hear how it worked for you, so pass on your experience as a comment, below.